If you live in a small place, you know that finding room for all of your essential stuff can be challenging. So what can you do besides wish for an extra closet? You can elevate your organizational efforts. We found 19 multifunctional hanging solutions that create more storage space. Coat. Hats. Umbrellas. Items like these eat up closet space. Luckily, you can transform any blank wall into useful hanging storage in just an hour or two using coat knobs. Most types require a drill to fasten. To keep things looking interesting, you can scatter the knobs across a wall instead of perfectly aligning. But what if you live in a rental where drilling into walls is a no-no? You can use peel and stick knobs like the colorful LOSJÖN hangers from IKEA. Grid panels are typically used to create store displays. At home, you can use them to store pretty much anything you can hang from tools to shoes. Many office supply stores like Staples and ULINE sell fixtures like these with either a black or chrome finish. If you crochet, you can make this off the hook hanging storage basket using a free pattern created by Norwegian blogger . It's perfect for storing soft toys or winter accessories like scarves and hats on doors and walls. Andreas Scheiger created a faux antler trophy any animal lover would heart using old bicycle parts, specifically the seat and handlebars. The result is a sturdy hanging unit that when mounted to wall studs can hold a bike. Elizabeth from Elizabeth Joan Designs created this pegboard storage board to clean out her messy utensil drawer. Now she no longer has to go drawer diving to find her favorite kitchen tools. It's easy to feel like you're missing out when your small entryway lacks storage space. But you don't have to sit around feeling robbed. Instead, you can create this stylish Scandinavian inspired "open" closet using two dozen double-prong robe hooks and a firmly anchored shelf. If you're not in the know, IKEA Trones are an insanely affordable storage solution that's both practical and pretty. While they were designed to store shoes, they can be hung anywhere in your home including your kitchen and bathroom. You'll find nine neat and tidy ways to use them here. That pile of footwear by your front door is a big sloppy mess. This easy to DIY shoe rack will keep your kicks organized and even better, off the floor. Bulky furniture can make a small room feel overloaded. But that's not the case with this wall mounted BILLY bookcase hack. It floats above the floor making it appear light and airy. Handmade projects when done right come with significant bragging rights. This easy to make no-sew wall pocket will organize those important papers piled on your desk. Plus, it looks stylish enough to show off to your friends. This chic vertical storage idea was made using a slatted wood bed base by IKEA. It's big enough to create two storage solutions as shown. Doodads like S-hooks are used to hang items. Have no place to put your shower stuff in your builder-grade tub? A tension shower curtain rod will help you create space for your sudsy essentials. Here's a sweet project that's guaranteed to elicit "awws" from friends and family (and help keep you organized). A curtain rod loaded with clip rings creates a neat and tidy place to show off your baby's adorable booties. 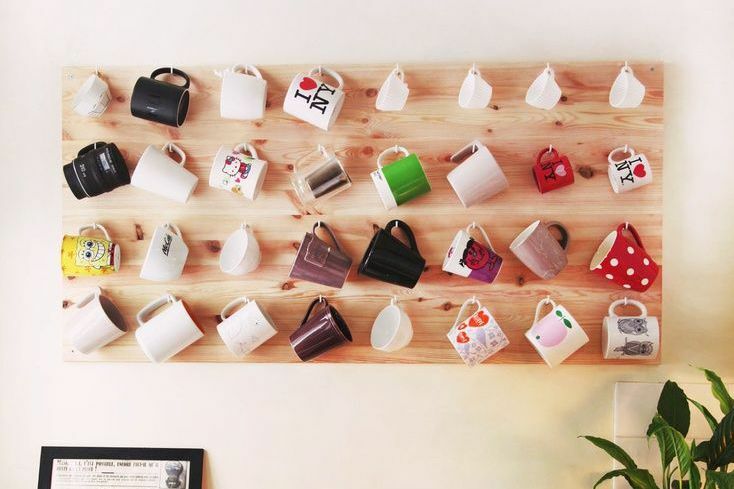 You and your roommates have a thing for coffee mugs. The problem is the cups are cluttering the cupboards. This wall mounted solution not only frees up cabinet space, but it also dresses up a dull kitchen wall. You would think magazine apps would make reading the subscriptions you paid real money for easier. Unfortunately, you get sidetracked by all the other neat stuff on your devices. Hanging your latest issues as shown will remind you to unplug and curl up with a good magazine. Mandi Johnson from a Beautiful Mess created this simple yet very efficient wire utensil rack. To create your own, you can either upcycle a piece of cattle wire fencing or purchase a remesh sheet at your local Home Depot for less than $10. FYI, the latter measures 42-inches-by-7-feet. That's enough to create a floor to ceiling storage solution. Are your favorite books languishing in a box under the bed or in the closet? This floating shelf will let you proudly display your cherished hardcovers.